SANTA ANA, Calif.- Santa Ana Elks Lodge hosted their Annual Public Safety Award Banquet for 2017. 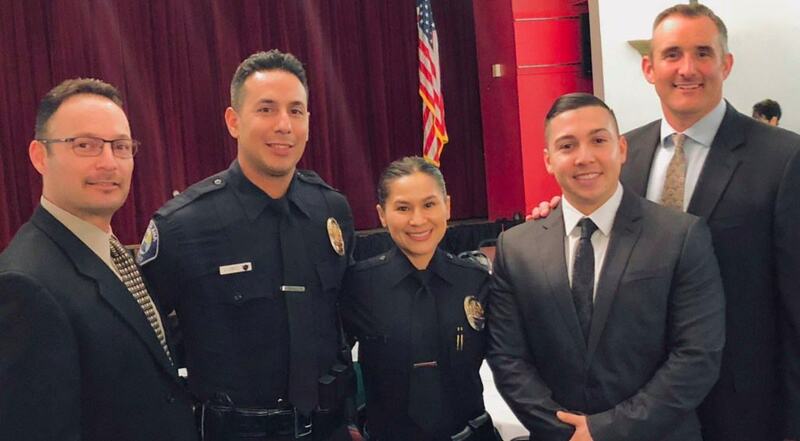 The Elks Lodge in collaboration with the Santa Ana Police Officers Association (SAPOA) and the Santa Ana Police Department (SAPD) honored members of the police department as the detective and the police officer of the year for 2017. L-R SAPOA President Gerry Serrano, Ofc. Jorge Lopez, Detective Maria Lopez, Ofc. Jonathon Perez and SAPD Commander Eric Paulson. SAPOA President Gerry Serrano introduced Police Officer Jonathon Perez as the Field Operations Uniform Officer of the Year for 2017. Perez joined the police department in March 2015 and is currently assigned to patrol night shift. Perez has been acknowledged for his thorough investigations and quality interviewing. Perez is proactive in the community, interacting with the residents while on patrol in a positive manner and his knowledge of the issues in the city. Perez is an avid soccer player. He played club soccer in Santa Ana as a youth, then played four years high school varsity soccer and was team captain, he played two years at a local community college and was team captain. Perez completed his Bachelor’s Degree in Sociology in 2013 from California State University, Fullerton. He is also a United States Army National Guard, Calvary Scout veteran. Detective Lopez has been a member of the Santa Ana Police Department for nine years. During her career she has been assigned to patrol, civic center directed patrol and is currently a supervisor for the Sexual Assault Unit. She also manages the Human Options resource grant for “breaking the cycle of domestic violence” through intervention and education. Detective Lopez is an Explorer Post Advisor mentoring the youth of our community who are interested in a law enforcement career. She is an avid runner and a member of the running team which participates in the annual law enforcement Baker to Vegas 120-mile relay race. Lopez also is a member of the women’s flag football team. Detective Lopez graduated from Santa Ana Unified School District Century High School in 2002. Lopez was a member of the highly competitive varsity basketball team for three years and was team captain for two years. Lopez played point guard for San Francisco State University women’s basketball team and was captain for two years. She completed her Bachelor’s Degree in Criminal Justice in 2007 from California State University, Chico. For the past two years, Lopez has been an assistant varsity coach at her alma mater Century High School. “My distinct pleasure to present a small token of our appreciation from the Santa Ana Elks Lodge,” stated Art Echternacht. ” A check for the Santa Ana Police Officers Association Widows and Orphans fund.” The Elks Lodge is a social club with a mission to help their community. Their donation provides assistance to fallen and injured members of the police department. Follow Santa Ana Police Officers Association on Facebook and Instagram #sapoa31strong for additional information.